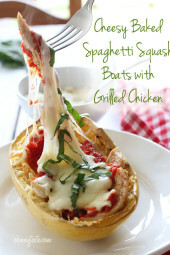 Roasted spaghetti squashed topped with marinara sauce, grilled chicken, melted mozzarella and some fresh basil. I had a hard time naming this one, but I think you get the point. 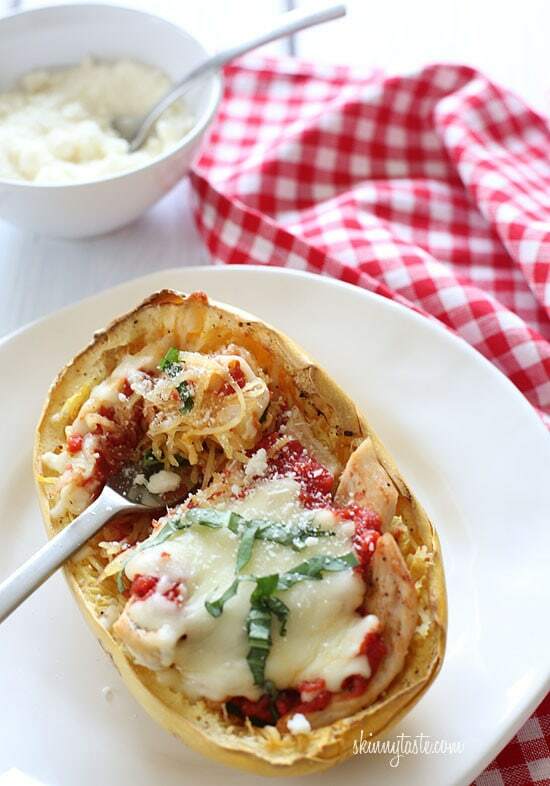 I was craving something cheesy for dinner last night, and I had spaghetti squash sitting in my counter without a plan, so I came up with this tasty dish. When my husband heard what I was making, he didn’t sound too excited, but after he ate he thought it was pretty good. If you’ve never had spaghetti squash before, it’s a winter squash that has spaghetti-like strands when you cook it and fluff it with a fork. Does it taste like spaghetti? Well no, it’s kind of neutral in flavor, so it takes on the flavor from whatever you season it with. I always have homemade marinara sauce on hand, either in the refrigerator or freezer, which makes quick weeknight meals a snap. If you want to speed this up, you can microwave the spaghetti squash instead, I provided both instructions below. For those of you on Weight Watchers, each boat is only 6 points plus and it filled me up. In fact, because it’s so light, I may use fresh mozzarella next time I make this so it’s even cheesier, this recipe can afford it! There are so many delicious types of winter squash, including acorn, butternut and spaghetti. Whichever gourd you go for, you can be assured you’re making a healthy choice. Winter squash is loaded with vitamins A and C, potassium and fiber. They also contain some folate and thiamin, a B vitamin that helps the body turn carbs into energy. Look for squash with a think, hard skin that’s free of blemishes. Make sure it feels heavy for its size—that’s a sign of freshness. You can keep squash for up to a month in a cool, dry place. Cut the squash in half lengthwise, scoop out the seeds and fibers with a spoon. Place on a baking sheet, cut side up and sprinkle with salt and pepper. Meanwhile, while the squash is roasting, season chicken cutlets with salt, pepper, garlic powder and oregano. Heat a grill pan (or a George formal grill) over medium-high heat, when hot grill chicken on both sides until cooked through, about 3-5 minutes. Set aside on a dish. 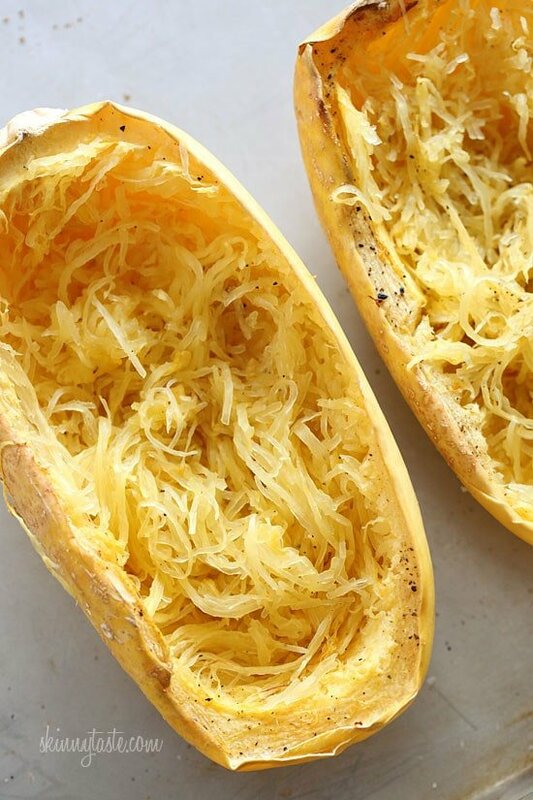 Remove the spaghetti squash from the oven or microwave and carefully fluff the spaghetti-like strands on each half with a fork, leaving the squash in the shell. Season with salt and pepper, then spoon about 1/4 cup marinara in each boat. Slice the chicken on the diagonal and place each piece on top of each squash half. 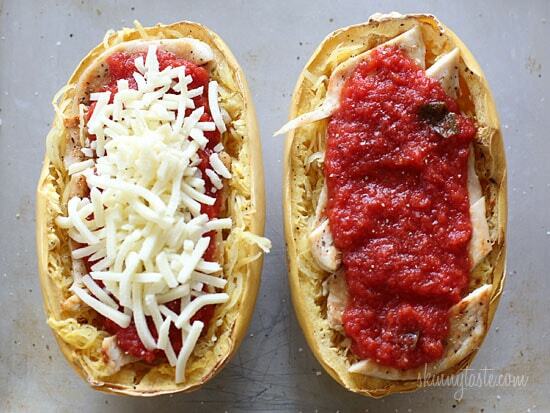 Top the chicken with 1/4 cup each of remaining marinara sauce, then top with cheese and place back into the hot oven and cook until the cheese is melted and the sauce is hot, about 12 minutes. 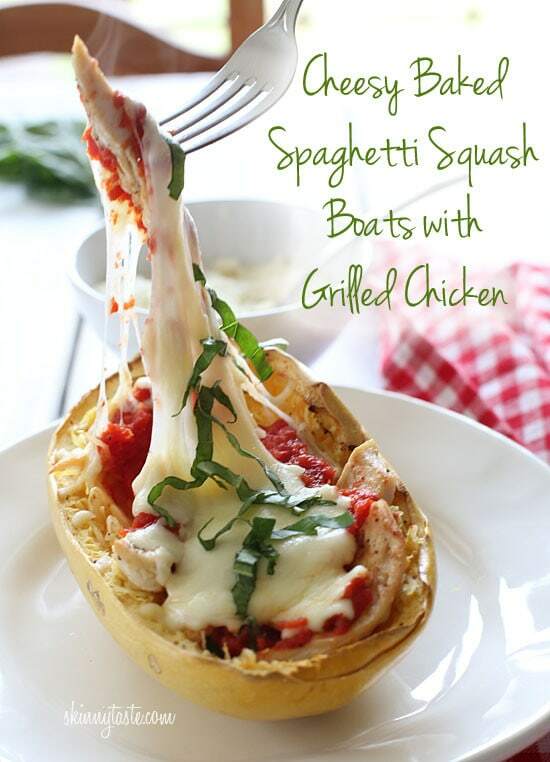 Garnish with fresh basil and serve with parmesan cheese on the side if desired. Nutritional information provided by Heather K Jones, RD (aka The Diet P.I. ).